Apple has announced it’s new mobile operating system the iOS 8 will be available this fall. 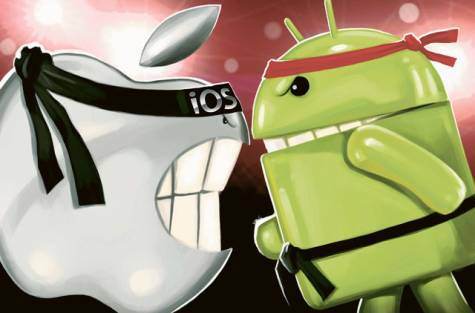 It seems with all the cool features that some android phones come with Apple is trying to give them cold hard stiff competition. I use both Apple and Android phones and for me I think they both have cool features even though the water proof feature on the Samsung S5 was a deal breaker for me. Have you ever wanted to take a picture of your face under water? or have you ever wanted to stop being paranoid about dropping your phone in the toilet? lol. well I know I have. Another deal breaker for me is that apple does not offer additional removable memory. It would be nice to have memory i can use to record videos and keep somewhere safe without having to download all the time..
— Health. Building on the popularity of stand-alone health products like the Fitbit and Jawbone, Apple will unveil a new app, Healthkit, to bring all the various health activities into one place. Apple is working with hospitals and doctors as well, to sync your health information directly to health providers, who can read the data and bring you in. — Family Sharing: A new tool to share privately among family members — photos, calendars and other information — will be a key feature in iOS 8. Additionally, parents will get notifications when their kids want to buy new apps, and will need their approval before the sale can go through. — Messages: When creating text messages, users can also create audio messages on the fly. — Keyboard: In a move to catch up to Google, Apple is adding predictive text to suggest words you might want to use as you’re typing. — Siri: The digital personal assistant gets upgraded — it can now be used to access songs with the Shazam song search and to purchase songs on iTunes. – HomeKit, a hub for controlling various apps for automating lights, garage doors, thermostats and the like. — Siri: The digital personal assistant gets upgraded — it can now be used to access songs with the Shazam song search and to purchase songs on iTunes.Apple also announced HomeKit, a hub for controlling various apps for automating lights, garage doors, thermostats and the like. OS X Yosemite:Apple is looking to one of the world’s premiere national parks for its latest operating system upgrade, Yosemite. — Spotlight search. The internal search now expands beyond what’s on your computer to also include the web, with tabs for Wikipedia, Yelp and Microsoft’s Bing search. — Phone calls. Folks who own iPhones will see caller ID show up on Mac computers when the phone rings. You can now answer iPhone calls on the Mac, or place calls on the computer by clicking the phone number on the Safari browser. — Bigger attachments for mail. The new attachment limit is 5 GB. — iCloud drive. A new folder on Apple computers will include iCloud drive, for saving files into the cloud, accessible via multiple computers and Apple mobile devices. Their WWDC conference was so boring — i actually fell asleep while watching, took a two hour nap and now i’m awake again. haha – and i’m NOT kidding. it was so boring. I love my iphone, macbook, ipad and all but apple needs to step up the phone game, like forreal..